It's been a while since I've gone head first into my scrap bin, however the scrap bin continues to overflow and could no longer be ignored. The overflow was messy business. My fabric scraps are many but they all vary in shape and size. The only reasonable conclusion to draw from this mess was to make a Postage Stamp Quilt. Postage Stamp quilts can by any pattern - not necessarily a light/dark fabric layout - and the name refers to the rather small scale of piecing. I am making a Postage Stamp Quilt with 16-patch blocks and I am strip piecing the blocks (cutting strips measuring 2 inches x 7 inches) just to speed things up a little thereby ensuring that I don't lose interest and end up with a doll quilt; the intention here after all is to use up those scraps (mind you, I do love doll quilts!). Each finished patch of fabric is 1.5 inches x 1.5 inches. I think you'll recognize many of the fabrics used! How happy and beautiful! Who wouldn't love that postage stamp? Eu só trabalho com sucatas e é muito bom saber de quadradinhos tão pequenos.Está linda.Feliz Páscoa!!! Such delightfully bright scraps! Can't wait to see it done! Keep going! I love postage stamps quilts and your has so many great fabrics mixed in. What a great scrappy project!! what an amazing happy quilt, just gorgeous! I have a postage stamp quilt. My husband's grandmother gave it to us as a wedding present. It has been well used the pat 41 years. Maybe that's how I can use some of my scraps. The trouble is every time I used my scraps, they seems to grow in the box. Too much fluffing I think! Coincidence, I am working on a postage stamp quilt right now. I have some blocks from a Flickr Scrapbuster Bee,and adding to it, because I want to make it into a picnic rug, with a waterproof fabric for backing. Interested in following how you will be quilting it! I'm also working on a postage stamp quilt. I cut my scraps into 1.5" squares and each block finishes at 4". I've really enjoyed the process on this project, and I'm nearing the finish line on stitching my blocks together. Your quilt already looks so pretty - I can't wait to see it finished! Great colours. Wow, 1.5" squares - that's tiny! It's weird to comment on Monday about something you posted tomorrow, Tuesday. However the postage stamp quilt looks great and is a good idea for using up scraps. Your quilt is so vibrant and such wonderful colors. Peter at Quilt Templates and More. Wow, amazing work. I admire your patience and your perfect alignment!! I love Scrap quilts, and this is looking beautiful. I make Scrap quilts all the time in the vain hope of reducing my scraps but somehow I always end up with more! Another mystery of the Universe? This looks superb, interesting that you say before you lose interest I will bear that in mind not to drag things out and just get on with it! Love love it! You seriously have the best looking scraps on this planet! 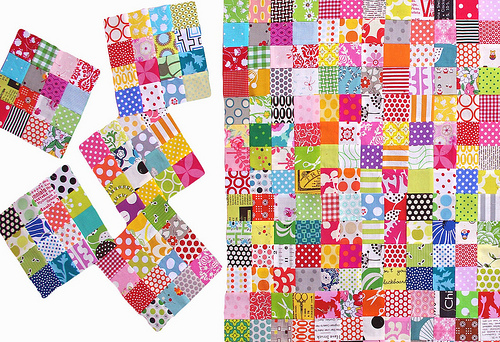 Gorgeous scraps - great quilt! What a great use for scraps. Your postage stamp quilt is so bright and cheery. I've been collecting a bag of 2" squares. I so admire your wonderful piecing skills - hmm, so very accurate! Wow! I really like the beautiful bright colors! This quilt is going to be beautiful! Beautiful colors , I really like it . It brought to mind the thought that since most of us online quilters buy the same fabrics , how many different fabrics can we find in each others quilts ? Or can we find fabrics no one else owns ? Bright, happy and scrappy - I love it! 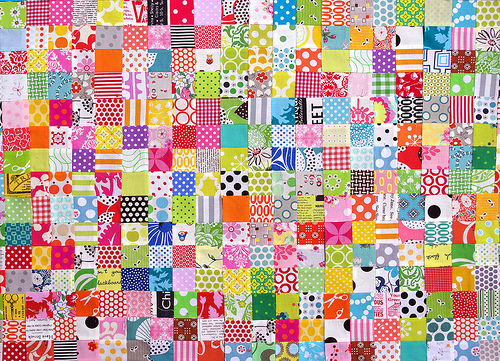 What a fun bright quilt that will make! Have you planned what size you want it to be? Sweet! I have been using the Granny square block to enjoy my favorites and this is on my bucket list! Yet another beautiful quilt, you have such an eye for colour and your quilts are exquisite. Very pretty! I'm working on one myself, made of all batiks. My squares are 2x2, so a little bit bigger, but I'm really enjoying the effect of all the different batiks!